Transport of a $300 commercial critter and a $150,000 valuable Texas Longhorn requires a difference in mentality, planning, equipment and a serious determination for safety. Don’t take this wrong. Don’t think the life of a $300 critter is of no value, but when one animal can be worth 500 times more than the $300 one, and several cattle may be on the same load, all of a sudden this gets to be a very serious business. Safety starts with equipment purchasing. Although this is not an exact science, there are ways it can be more professional. Most people, when buying a trailer, slam a few doors, kick tires and check the price. A more dedicated approach is to crawl under the trailer and see the real important things, especially on a used trailer. Does the electric work? Are the brakes in good shape, check the brake wires, has the trailer been wrecked or damaged? Is the frame twisted? No great skill is needed to check out these things. Aluminum floors are better, last longer and safer than wood floors. Wood floors will weaken, rot, break and require replacement. Yet, not looking is not knowing. This is a method of transport used for showing cattle. Although this design is not often seen in Expo parking lots, it allows a maximum amount of air flow for Summer or Winter. It can be adjusted and used for hauling hay, wild boar crates, sod, fire wood, Batesville caskets, #6 bear traps and adjusts to fit any size of cattle with professionally attached extensions. Others on the highway should be encouraged not to tail-gate. Air is important, lots of it, or very little. In cold climates a solid trailer front drop and solid sides up to about 60” is very important. When a load of cattle are traveling in 30 degree weather at 70 MPH with an open air trailer that equates to a well below zero chill factor. A tight closed trailer makes it closer to the 30 degree mark. If healthy cattle are the goal, control the air. In hot climates a lot of air is important. Lots of ventilation keeps the cattle comfortable. One of the dastardly acts a driver can commit is to stop with a load of cattle on a 100 degree day and savor a steak lunch in an air conditioned restaurant. The increased body heat with several cattle in a tight trailer will move a cow’s actual temperature to a dangerously high number in a very short time. When the same trailer is used in hot or cold weather the closed sides and ceiling intake vents are the best of both worlds. It can be adjusted with the weather. Still considering air, carbon monoxide will kill all animals. NEVER, NEVER have a trailer with an open air front drop where the exhaust fumes blow right into the cattle’s faces. Although you may, as a human, be adapted to handle a lot of carbon monoxide, your cows live a clean air pristine pasture life and have no resistance to this deadly gas. When cattle arrive for an event and won’t eat, drink or look alert --- that is a sign of being “road gassed.” Don’t call a vet, the hauler did it with badly designed equipment. Well before a trip, check the trailer tire pressure. Make sure the pressure is the recommended amount printed on the side of the tire, or better yet, up to 10 lbs more. A little more air increases the load capacity and allows the tires to run cooler. Tires with ratings well above the axle gross vehicle weight will assure the tires will hold up with a heavy load. Good tread is important. A tire normally blows during a trip -- when it is being used. Always be prepared with one or two good spare tires and all the tools to change it. Carry a flash light, they never blow in the day time. Walking around the trailer, check the hitch for a proper fit and latch hookup; also the brakes and lights. The safety chain must be attached for just enough length and not too much. Don’t let the safety chains drag the pavement or they will go away. The hitch ball must be tight. Any sign of a loose ball must be fixed. If every trailer clearance and rear light is working it might possibly reduce the chance of a harassing stop-check by a non-friendly patrolman. The center gate is critical. It should be built at least 8” above the floor. If a cow lays down it is much easier for her to get back up and remove her legs. A gate 4” off the floor is a good way to get a leg caught. The center divide gates should be solid from the floor up to at least 60.” If bulls can’t see one another they will ride without fighting through the divide gate and messing up the gate, even getting it open during the trip. The divide gate should be tall enough that an animal could never get part or all the way over it, nor get their head or horns caught trying. The same goes for the rear gate. Parallel vertical openings are the main cause of broken horns in trailers and squeeze chutes. Wide trailers are more cost effective per square foot than narrow ones and safer for large horned cattle. Punch side aluminum trailers are an absolute “No, No” for Longhorn cattle. The ideal way to know what your trailer is like on the inside is to ride down a country road and put yourself in the cow’s place. Have someone pull you in your own trailer. You may find loose parts, loud noises or weak structures not noticeable any other way. It is a test worth the time. If you find yourself slipping around on the floor, be sure the cattle also will slide around. Every floor should have some traction of rubber, textured aluminum, or rebar. At last, after the cattle are loaded, make sure all gates are closed. Just closing the latches is not enough. The world famous artist, T. D. Kelsey, who sculpted the “Texas Gold,” was hauling a full load of cows when a hinge broke on his escape door, then a second hinge and out rolled the cows, one by one rolled into a ditch. The great old Texas Longhorn producer Frank Doherty was taking a load of cattle home after a sale. While stopped at a restaurant some worthless thug opened the rear gate and turned his cattle loose on the freeway. From then on Frank not only closed the latches, he wrapped a sturdy chain around each closure with a big fat lock securing it. That is the rear gate and the escape door and the sliding rear door, all of them. If you were loading-out at a sale, from then on, if Frank was there, he would walk around your trailer and get real serious with anyone that didn’t have heavy chains and locks correctly attached. 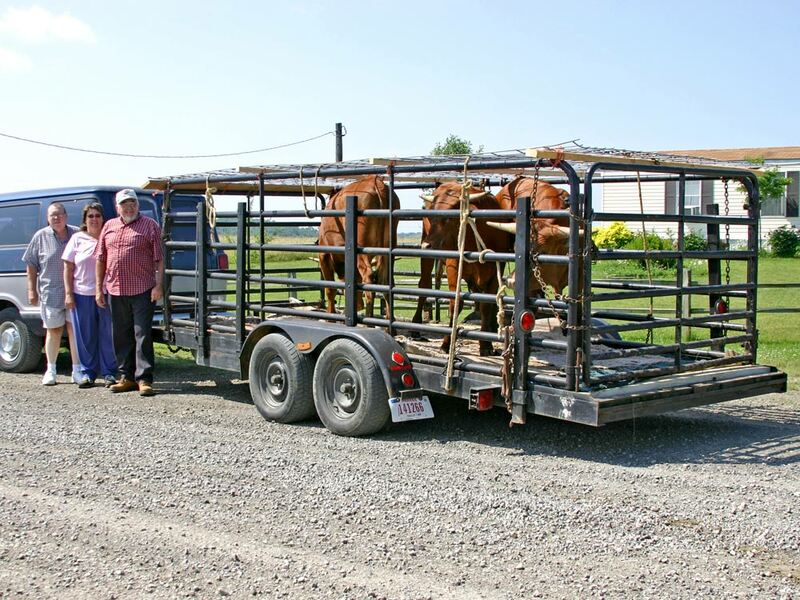 Hauling valuable cattle is not just going from point A to point B, it is a matter of being deliberate, professional and touching all the bases. Remember there are idiots in the world. Lots of thugs and idiots! They may decide you are not taking good care of your stock and they will help by turning them out to graze some pretty green grass on the edge of the freeway. Don’t allow them to make that decision!